Khirbet Qumran - What Do You Know About Khirbet Qumran? Twenty kilometers south of Jericho lies one of the world's oldest monasteries, the Monastery of the Essenes. This is the place were the world famous Dead Sea Scrolls were discovered by a Bedouin shepherd who happened upon several scrolls in clay jars hidden in a cave on a rocky cliff high above the Dead Sea. Among the findings were books of an unknown religious community, identified as the Essenes, a pre-Christian, mystical Jewish sect. The writings in these scrolls covered a period of 300 years, including the birth of Christ. 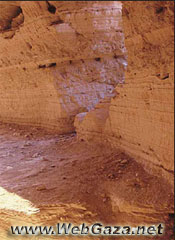 The Essenes community came to Qumran in the late second century BC. They lived in caves and dwellings around Qumran under strict rules of obedience and high ethical standards in a secluded life of prayer and study. In 68 AD the settlement came to an abrupt end when a Roman legionen route to Jerusalem to put down a revolt, destroyed the community.